Cardamom is commonly used as spices or mouth freshener. It comes in two types: the small and large cardamom. We use big cardamom to prepare delicious dishes where small cardamom is used to enhance the aroma of recipes. Both the cardamom gives good impact on our health. Sore: If you have sore throat and pain then you should chew cardamom in the morning and at bedtime. After that you can drink lukewarm water. Swelling: If you have swelling in the throat then you can grind the small cardamom in radish water. It is very beneficial to the patient. Cold: Take a cardamom, a piece of ginger, cloves and five basil leaves. Keep them in betel leaf and eat it. It is very beneficial in cold-cough. Vomiting: Take five grams of big cardamom and boil it in water. When water remains ¼ amounts then remove it from gas. This water can stop vomiting. Ulcer: Take big cardamom and grind it. Mix mishri and keep it on your tongue. It gives you instant relief in mouth ulcers. Indigestion: If you have acidity in stomach then immediately eat cardamom. Also, if you eat more food then you can eat it and you’ll feel lightness. Nausea: If you are feeling nausea in bus or car then get dizziness then immediately keep small cardamom in your mouth. You will get instant relief. 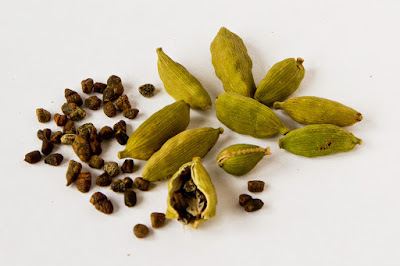 Bad Breath: If you get bad smell from your mouth then you must take the cardamom after every meal.